Very clever Jana. I love it. 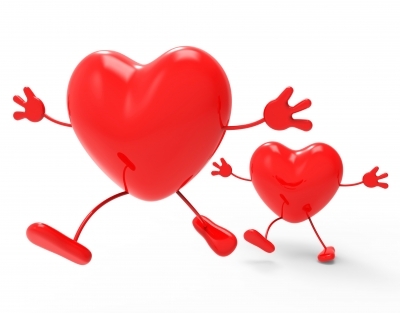 Exercise is good for your heart. This much apparently!! Catching up with loved ones. I'm late replying to WW this week! Life has been extremely busy. Those are fabulous captions, Mary. I think my fave is, "Love is a marathon, not a sprint." Very clever. Haha. "I didn't imagine things going this say when I said, I love you," cracked me up. Great caption, Britney. BTW, thank you for following along with all of Mylissa's posts this past week. I love, "Running after my heart." Nice one, BN! Such a great answer Jana. Congrats. "Please catch me," is a great caption for this image, Sherry! You set my heart to racing. Come here big boy, I love you. I LOVE, "You set my heart to racing." So creative. Nice job, Rita. Love, love, love that caption, Christy. So perfect! Come back, come back! Don't leave me now! You really are the heart of my heart! Nice captions, Karen. I think my fave would have to be, "Come back, come back! Don't leave me now!" Oh, another one!! Nice!! Haha. That one made me laugh. "Come back! I just want to love you forever!!" Hm...I guess this also reminds me of me and my one cat...lol!! I just want to snuggle her forever, and she's like...NOPE! Well, I LOVE all of those captions, Natalie. I love your thoughts as well. Cats are so funny. They only want to cuddle at their discretion. And we do exactly what is pictured in this image!! So funny. :) We DO do that. My youngest, though, LOVES to snuggle. He even tries to get into my shirt to be as close to me as possible!! He'll headbutt me in the head/neck to get underneath my neck when I'm laying on my back. He's such a sweetheart. So cute. I am a cat lover, but my daughter is allergic, so no cats for me. She doesn’t live at home anymore, but it would make visits really tough for her. Enjoy those cute little cats!!! Aw, I'm sorry! Do you have any other pets? No, I love dogs, but just not in my house!!! I had a cat when my hubby and I first married and she was our BABY. I do miss the companionship of a pet, but I don't miss the constant clean up.